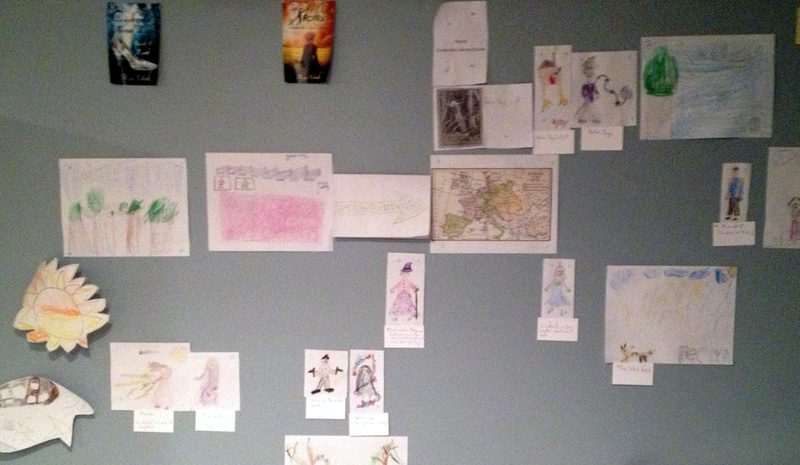 My kids' artwork and interpretation of characters in my book on my bedroom wall. Cinderella in her winter outfit for the forthcoming Found: Cinderella's Secret Diaries (book 3 in the series). To help with the creative process, I would sometimes give some instruction by explaining who the character was, his/her personality and what they wore. I would then leave them to their work and return a few minutes later after they had finished their artwork. What amazed me is their creativity and excitement in using their imagination to "see" the characters I had created in my series. Considering they had never read the books (my children are young and the Cinderella's Secret Diaries series is geared toward teenagers and above), I was impressed at their craftsmanship and willingness to work with me. Siblings are rivals. Separate your kids and set them up in different rooms. They are unique artists with different strengths and skills. Encourage them and do not compare their work. Do not push. There is not deadline. This is for fun and to spend time with your children. When they become bored, put the work away. Don't throw it away, save it and see if they'll return to the projects days later. In today's fast paced world, my kids want to be on the iPad or a computer playing games, watching movies or consuming some sort of media. With a simple exercise like drawing, my kids and I went through the entire creative process and they created fantastic artwork. They helped me and I helped them. Together we worked on building a physical representation of the world I had created in my series and it was magical. On many levels, a simple exercise of drawing and communicating with each other helped us come closer as a family. When I'm up at 5:30 a.m. writing, my kids now know what I am doing. They might not know the plot and the specific details but they know that their dad writes about a re-imagined Cinderella who deals with faeries and fights against Napoleon. Over time, the wall of my bedroom became flushed out with more and more artwork filled my wall so that I now have a clear map of what characters are in which places in the world. I cannot tell you how helpful this was for me as I wrote my last two books. And knowing that my children loved participating in the creative process made our times together special. It's not every day that you get to sit down with your kids and draw and create a world on the wall of your house. I loved our time together and can't wait until we can work together again. It's a small thing, but I wanted to treat my kids with respect and to nurture their art. For me, having them share in my own creative process worked like a charm as it was a great success for the entire family. If you choose to do something similar with your kids, drop me a comment below and let me know how it went for you. Thanks!